The communist authorities control the Catholic Church in Vietnam, says Auckland Vietnamese Community chaplain Father Andrew Nguyen, the New Zealand Catholic Newspaper reports. Father Nguyen left Vietnam 23 years ago and said that after seizing power in 1945, the communists tried for about the next 30 years to destroy the Church there. During those years churches were destroyed, bishops were jailed and Catholic schools were closed. He said the communists take advantage of the power and authority that the people see in the role of priests and bishops. "The people, the Catholics, they listen to the bishops and the priests. If you have a bishop with you, all the people will follow you, so it's easy." About two years ago, Nguyen said, an Auckland priest holidayed in Vietnam and after his return to New Zealand. The priest spoke to Nguyen about meeting another priest in a cathedral there. "He said, 'Andrew, I got in touch with the priest, and he's a really holy man,' and I asked him: 'What's his name'?" When he was told the name of the priest he said, "Oh my goodness. He's one the communists use to control all the churches in Vietnam. "He's a Communist Party member, and he's the most powerful man in Vietnam over the Church." Nguyen said it was very sad, adding, "But the Catholics have a very strong faith. They believe in God, they believe in the teaching of the Church." Catholics make up about 10 per cent of the population, he said - about 8-9 million among a total population of about 90 million. 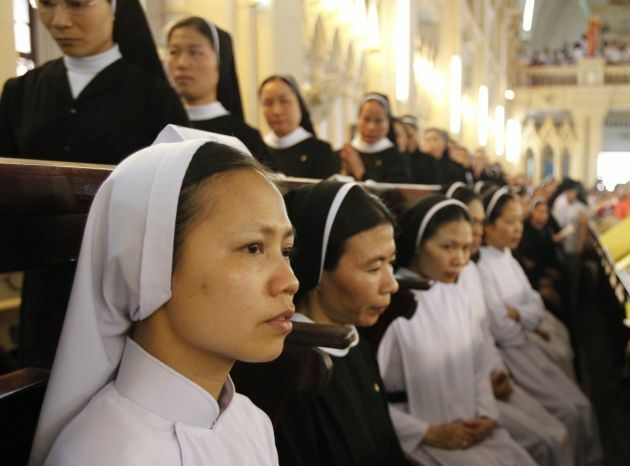 Vietnam is frequently cited by organizations that monitor religious organizations. In January 2013 Vietnam published a decree that stated that Christian groups would in future need to secure official permission from the People's Committee in their local village and precinct before gathering for religious activities. Unregistered churches are required to secure their village leader's permission before they start meeting together for prayer, worship, and other ceremonies. Known as the Decree on Religion 92/2012 ND-CP, or simply ND-92, the new decree is meant to clarify rules written in 2005. Charismanews.com reported in March that eight years ago, the highest levels of the Communist Party and the Vietnam government signaled a shift away from direct ideological opposition to, and repression of, religion, especially Christianity. But new laws and actions indicate a tightening of action against Christian religious groups. "There were reports of abuses of religious freedom, including religious prisoners and detainees and reports of individuals and congregants being monitored and harassed. Reports of abuses of religious freedom remained at a consistent level compared with the previous year," the U.S. State Department's International Religous Freedom Report of 2012.